This notice provides information further to the provisions of The Value Added Tax (Amendment) Regulations 2018 (SI 2018 No. 261), which amend the VAT Regulations 1995 (‘the regulations’). Parts of this notice include rules that have the force of law under the regulations. These rules are indicated by being placed in a box. Unless otherwise indicated within the rule, all of the rules contained in this Notice have the force of law from the date the regulations have the force of law. This notice gives guidance on the digital record keeping and return requirements for Making Tax Digital for VAT. This notice is not a standalone document and should be read in conjunction with other VAT notices, in particular the ones listed at paragraph 1.3below. These are all available on GOV.UK. This notice provides further details of the Making Tax Digital rules. Make sure you have read the notices relevant to your circumstances before you submit your VAT Return. VAT taxable turnover is the total value of everything you sell that is not exempt from VAT. VAT Notice 700/1: should I be registered for VAT provides more information on the VAT registration threshold and taxable turnover. If you think any of these apply to you then contact the VAT Helpline to discuss alternative arrangements. If HMRC consider that an exemption is not appropriate, digital assistance may be available to help you get online support. If you are exempt from Making Tax Digital you may still choose to follow the Making Tax Digital rules. To do this, you must tell HMRC before the start of the next VAT period that you want to use the Making Tax Digital service and also the date that your next VAT period begins. You will then be subject to the Making Tax Digital rules from the start of that next VAT period. You may decide, for a later period, that you no longer wish to follow the Making Tax Digital rules. If you are still exempt from Making Tax Digital at that point, you can tell HMRC you want to leave the Making Tax Digital service and submit returns the way you submitted them before you chose to follow the Making Tax Digital rules. This will be from the start of the next VAT period following the date you told us. You must tell HMRC in writing if you want to join or leave Making Tax Digital. All VAT registered businesses must keep and preserve certain records and accounts. Under Making Tax Digital, some of these records (see paragraph 3.3) must be kept digitally within functional compatible software (see paragraph 3.2). Records that are not specified in this notice, or that are not required to complete your VAT Return, do not need to be kept in functional compatible software. Some software will record all your VAT records and accounts information. However, there are some records that by law must be kept and preserved in their original form either for VAT purposes or other tax purposes. For example you must still keep a C79 (import VAT certificate) in its original form. A business receives an invoice and types selected data contained in the invoice into functional compatible software. They must still keep the invoice in its original form as the data in the functional compatible software is not a copy of the invoice. A business has functional compatible software that scans the invoices received and puts the information in its ledger. If the image is retained and contains all the detail required for VAT purposes then the business does not need to keep the original invoice unless it is required for another purpose. If you deregister from VAT you will no longer need to keep digital records in functional compatible software, but you must retain your VAT records for the required period. VAT notice 700/21 provides more information on keeping VAT records. HMRC expects that there will be software products available that will perform all of the functions listed above. Some software programs will not be able to perform all of these functions by themselves. For example, a spreadsheet or other software product that is capable of recording and preserving digital records may not be able to perform the other 2 functions listed above, but can still be a component of functional compatible software if it is used in conjunction with one or more programs that do perform those functions. It follows that transferring data manually within or between different parts of a set of software programs, products or applications that make up functional compatible software is not acceptable under Making Tax Digital. For example, noting down details from an invoice in one ledger and then using that handwritten information to manually update another part of the business functional compatible software system. A ‘digital link’ is one where a transfer or exchange of data is made, or can be made, electronically between software programs, products or applications. That is without the involvement or need for manual intervention such as the copying over of information by hand or the manual transposition of data between 2 or more pieces of software. A digital link includes linked cells in spreadsheets, for example, if you have a formula in one sheet that mirrors the source’s value in another cell, then the cells are linked. HMRC does not consider the use of ‘cut and paste’ to select and move information, either within a software program or between software programs, to be a digital link. HMRC will allow a period of time (‘the soft landing period’) for businesses to have in place digital links between all parts of their functional compatible software. For the first year of mandation (VAT periods commencing between 1 April 2019 and 31 March 2020) businesses will not be required to have digital links between software programs. The one exception to this is where data is transferred, following preparation of the information required for the VAT Return, to another product (for example, a bridging product) that is API-enabled solely for the purpose of submitting the 9 Box VAT Return data to HMRC. The transfer of data to this product must be digital. For the first year of mandation (VAT periods commencing between 1 April 2019 and 31 March 2020), where a digital link has not been established between software programs, HMRC will accept the use of cut and paste as being a digital link for these VAT periods. A digital link is an electronic or digital transfer or exchange of data between software programs, products or applications. The use of ‘cut and paste’ does not constitute a digital link. If a set of software programs, products or applications are used as functional compatible software there must be a digital link between these pieces of software. 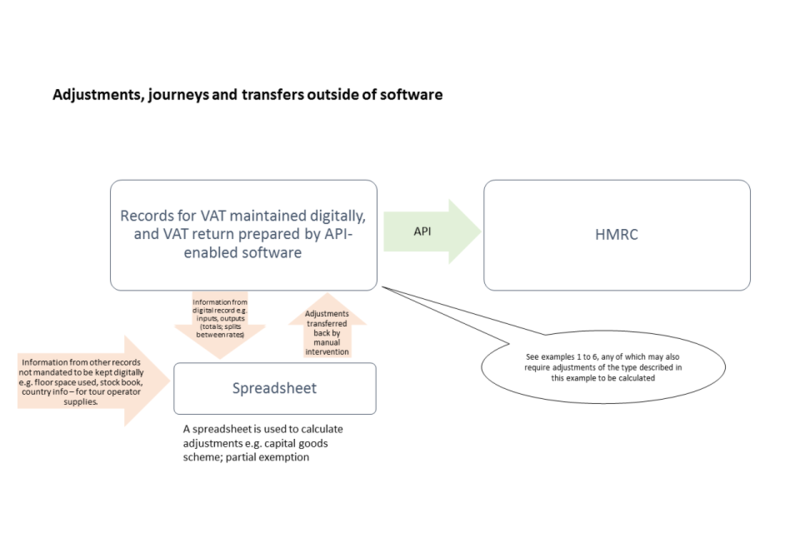 This digital link is required where the data to be included in any of the boxes of the VAT Return has been prepared within a software program, product or application, and this data is then transferred to another program, product or application in order to submit the VAT Return data to HMRC via the APIplatform. For VAT periods starting on or after 1 April 2020, there must be a digital link for any transfer or exchange of data between software programs, products or applications used as functional compatible software. HMRC recognises that there may be points during preparation of your VAT Return when calculations will have to be made outside of any software you use to keep the digital records, or there may be a need to enter data into your software from particular sources. For example a capital goods scheme adjustment calculation done in a separate spreadsheet may need some form of input by hand into the software that will send your VAT Return information to HMRC. The submission of information to HMRC must always be via an Application Programming Interface (API). 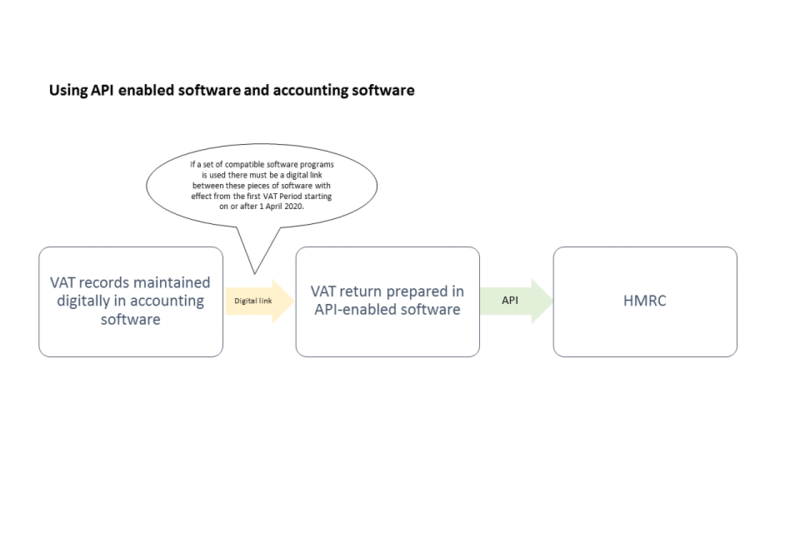 While HMRC expects most businesses to use API-enabled commercial software packages both to keep digital records and file their VAT Returns, the following alternatives may be available. 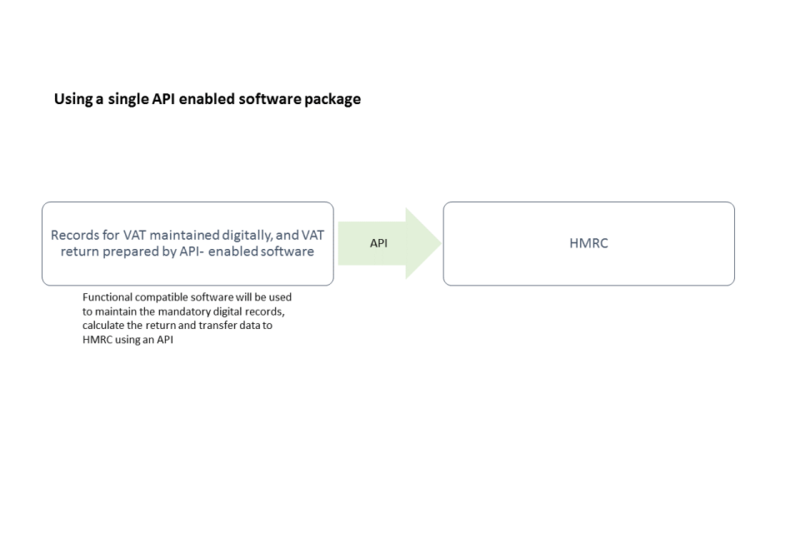 This is a digital tool (incorporating relevant Making Tax Digital APIs) that is used to connect accounting software to HMRC systems, and allows the required VAT information to be reported digitally to HMRC, and for information to be sent digitally back to the business from HMRC. The examples in Section 7 include a number of examples of situations where a VAT registered entity is using a set of software programs with digital links that meet the requirements of Making Tax Digital. The examples also include situations where the transfer of data between programs does not need to be via a digital link as well as situations where a digital link is not mandatory for VAT periods starting before 1 April 2020. The records listed in the following paragraphs must be kept, maintained and preserved in digital form. The regulations refer to this information as your ‘electronic account’. The exact way you must enter the information will depend on the software package you have. Contact your software provider if you are unsure how to enter information into your software. HMRC can only provide advice on the legal requirements of Making Tax Digital. You will need to keep additional records, such as invoices. You do not have to keep these digitally but you may choose to do so. For more information on the additional records that must be kept for VAT purposes, see VAT Notice 700/21: keeping VAT records. This only includes supplies recorded as part of your VAT Return. Supplies that do not go on the VAT Return do not need to be recorded in functional compatible software. For example intra-group supplies for a VAT group are not covered by these rules. The time of supply is the date that you must declare output tax on. Typically this is when you send a VAT invoice or, if you are on cash accounting, when you receive payment for the supply. For more information on time of supply, see VAT Notice 700: VAT guide, section 14 and section 15. Where more than one supply is recorded on an invoice and those supplies are within the same VAT period and are charged at the same rate of VAT you can record these as a single entry. You sold 10 standard rated items and 15 zero rated items on a single invoice then you would only need to record the total figures for each of the VAT rates. You are on standard accounting and a customer makes a part payment before you send out an invoice. If the payment and invoice were received and sent in the same period, you can record the supply as one transaction with one transaction date. Otherwise, where one supply needs to be recorded in different periods the precise manner will depend on the software. This could be done by splitting the amounts out, or the software may allow one line to show different periods for the VAT to be recorded. You must also have a record of outputs value for the period split between standard rate, reduced rate, zero rate, exempt and supplies which are outside the scope of UK VAT. However, you only need to keep a digital record of ‘outside the scope’ supplies that you are required to include in your VAT Return. For more information on completing your VAT Return, see VAT Notice 700/12. Where you need to apportion the output tax due on a mixed rate supply with a single inclusive price you do not have to record these supplies separately. You can record the total value and the total output tax due. Not all software will allow you to record a rate of VAT other than the standard, reduced or zero/exempt. If this is the case, this mixed supply should be recorded as either one standard rated supply and one zero rated supply or you can record the sale at one rate and correct the VAT through an adjustment at the end of the period. You will also need to do this if you are using a margin scheme or the flat rate scheme. A business sells a meal deal for £3. It contains a zero rated sandwich, a standard rated pack of crisps and a standard rated drink. The apportionment shows that the VAT due is 30p. The business can record this as an individual supply with 30p of output tax if their software allows this. Below are 3 potential ways this could be recorded. If their software does not allow this they could record the supply as a standard rate element of £1.50 and a zero rated element of £1.20. Alternatively, they could record the meal deal as one entry and correct the VAT at the end of the period. A third party agent can act for, or represent, a business in arranging supplies of goods or services. The supplies that you arrange are made by, or to, the business represented. HMRC is aware of a number of circumstances in which a third party agent makes supplies on behalf of a business and it may not be possible or practical for the business to record digitally every single supply. Therefore HMRC can accept businesses recording these digitally as a single invoice. Where a third party agent makes supplies on your behalf, those supplies do not fall within the digital record keeping requirements until you receive the information from the agent. Where the information is received as a summary document you can treat this document as one invoice issued by you for the purpose of creating your digital record. This relaxation only varies the requirements on maintaining records using functional compatible software. It does not change any other record keeping requirements set out in VAT legislation. Further information on supplies made by or through agents can be found in VAT Notice 700: VAT guide, section 22 to section 25. A business uses a letting agent to rent out a number of properties. Each month the letting agent provides a summary of the rents collected and VAT charged. The business can treat all supplies covered in this summary document as if they were covered by a single sales invoice, rather than treating each invoice issued on their behalf separately. They can group transactions together providing they are within the same VAT period and are charged at the same rate of VAT. This rule would not cover circumstances where responsibility for supplies is assumed by other persons who are not third party agents of the business. For example it does not cover supplies made by an employee on behalf of your business or by a charity volunteer for the purposes of a fundraising event such as a church fete. This only includes supplies recorded as part of your VAT Return, supplies that do not go on the VAT Return do not need to be recorded in functional compatible software. For example, wages paid to an employee would not be covered by these rules. There is no requirement under the regulations to record inputs for the period split by VAT rate. The time of supply is typically the date on the VAT invoice or, if you are on cash accounting, when you pay for the supply. However you must also hold the associated evidence to claim deduction of input tax. For more information on time of supply, see VAT Notice 700: VAT guide, section 14 and section 15 and also paragraph 10.5 of that same Notice for information on timescales for claiming input tax. See paragraph 3.4 of this Notice for information on adjustments. Where an invoice includes supplies with different times of supply that are within the same VAT period, you may record all supplies on the invoice as being at the same date. A business uses cash accounting and has paid the amounts on the invoice over 3 months. Two of the months are in the same VAT period so can be recorded together. The payments relating to the other month must be recorded separately. The precise manner of recording the information in different periods will depend on the software. This could be done by splitting the amounts out, or the software may allow one line to show different periods for the VAT to be recorded. If a business pays the actual cost or a proportion of the travel and subsistence cost of an employee, it can claim the total or a proportion of the total input tax incurred. Where you are claiming input tax on employee expenses and your employee provides the combined value of more than one purchase, you do not have to record each purchase separately. You can record the total value and the total input tax due. Further information on subsistence and the effect on input tax claims can be found in VAT Notice 700: VAT guide, section 12. HMRC is aware of a number of circumstances in which a third party agent makes purchases on behalf of a business and it may not be possible or practical for them to record digitally every single supply received. Therefore HMRC can accept businesses recording these digitally as a single invoice. Where a third party agent makes purchases on your behalf, those purchases do not fall within the digital record keeping requirements until you receive the information from the agent. Where the information is received as a summary document you can treat this document as one invoice received by you for the purpose of creating your digital record. If your software records reverse charge transactions you do not need separate entries for the self supply and purchase. If your software does not record reverse charge transactions you will need to record reverse charge transactions twice, once as a supply made and a second time as a supply received. For information on reverse charge transactions see VAT Notice 741A: VAT place of supply of services, section 5. A total of each type of adjustment must be recorded as a separate line. Where you are allowed or required to adjust the input tax claimed or output tax you owe according to the VAT rules you must record this adjustment in functional compatible software. Only the total for each type of adjustment will be required to be kept in functional compatible software, not details of the calculations underlying them. If the adjustment requires a calculation, this calculation does not have to be made in functional compatible software. If the calculation is completed outside of functional compatible software then digital links are not required for any information used in the calculation. However using software for all your calculations will reduce the risk of errors in your returns. Where the input tax claimed or output tax due on a supply has been changed as the result of an adjustment you do not need to amend the digital record of the supply. A partly exempt business software allows it to record amounts of VAT relating to both exempt and taxable supplies. At the end of the period they complete a partial exemption calculation and put the adjustment into their return. The calculation is not completed in the software. The business does not have to go back and change each line in the software to reflect the amount of recovery on each invoice. A business has a software package that requires a period to be closed before the return can be completed. After the period has been closed the business is calculating adjustments before submitting the return. Invoices are found that should be included on the return. The business can enter the figures as an adjustment to ensure the return is correct, but they must record the invoices in their functional compatible software to complete their digital records. Error corrections are made by one of 2 methods. For more information on correcting errors, refer to VAT Notice 700/45: how to correct VAT errors and make adjustments or claims. Where a business makes an error correction using method 2, they are not required to amend the input tax claimed or output tax charged recorded in the digital record of the supply. A business notices an error in its records. The total value of the error is £65,000 so the business must correct the error using error correction method 2. The business does not have to make any changes in its functional compatible software, but must keep all records as normal. In addition to the records listed in paragraph 3.3 above, if you account for VAT using a retail scheme you must keep a digital record of your Daily Gross Takings (DGT). You are not required to keep a separate record of the supplies that make up your DGT within functional compatible software. For more information on retail schemes and Daily Gross Takings see VAT notice 727: retail schemes. If your software does not include a Flat Rate Scheme setting, and does not allow you to include a rate of VAT other than standard, reduced, zero/exempt, then you will need to record the supply as either one standard rated supply and one zero rated supply. Alternatively, you can record the sale at one rate and correct the VAT through an adjustment at the end of the period, using the same method HMRC will allow you to use to correct the VAT on a mixed supply (see paragraph 3.3.2 above).Further information on the Flat Rate Scheme can be found in VAT Notice 733: Flat Rate Scheme for small businesses. You are not required to keep the additional records required for these schemes in digital form, nor are you required to keep the calculation of the marginal VAT charged in digital form. These records must still be maintained in some format. If you do keep a digital record and your software does not allow you to record the VAT on the margin, then you will need to record the supply as either one standard rated supply and one zero rated supply. Alternatively, you can record the sale at one rate and correct the VAT through an adjustment at the end of the period, using the same method HMRC will allow you to use to correct the VAT on a mixed supply (see paragraph 3.3.2above). Further information on Margin Schemes can be found in VAT Notice 718: the Margin Scheme and global accounting and VAT Notice 709/5: Tour Operators Margin Scheme for VAT. VAT updates is a feature of Making Tax Digital that will be available at a future date. They will allow businesses to provide VAT information to HMRC outside of a VAT Return voluntarily. A VAT update will not include different information to that submitted in a VAT Return. Further information and detail about this functionality will be published in due course. Supplementary data is a feature of Making Tax Digital that will be available at a future date. It will be voluntary. HMRC will specify what supplementary data will be, but broadly this will be information that supports the 9 box VAT Return that is the summary data described in paragraph 3.3.5 above. You will be able to submit supplementary data each time you submit a voluntary VAT update or VAT Return. Further information and detail about this functionality will be published in due course. You may authorise HMRC to receive data from (and send data to) an agent on your behalf in relation to any Making Tax Digital service. Once you have done this, that agent can sign up your business to that service, and use software to create, view, edit and send your data to HMRC. Your agent may also keep and maintain digital records on your behalf. If you have previously authorised HMRC to receive your VAT Return from an agent they can still do this. Agents will not need to be re-authorised by their clients to act for them in the Making Tax Digital VAT service where they already have existing authorisation to act for VAT purposes. You will be able to have more than one agent if you wish, performing different Making Tax Digital services for you, and you will be able to manage different levels of permission for each of them. Agents will need to sign up to a new agent services account to use Making Tax Digital services on behalf of their clients. The agent must have software of their own or have access to the software that holds your digital records. Agents will not necessarily have access to all of your source data so, for example, they may not always be able to make corrections to your digital records. In these circumstances your agent will need to advise you of any corrections required to those digital records. HMRC will provide access to taxpayer information we hold, and the necessary services, only to those agents who have been properly authorised. The examples set out here are intended to illustrate the extent to which a digital link is required between programs within a set of software programs used by a business or its agent. They show where information transfer must be digital and where it need not be, taking into account the variety of digital record keeping and reporting options that businesses will have. These scenarios are not intended to be exhaustive or prescriptive; they merely illustrate the more common ones. The image below describes a business that uses a single functional compatible software package. It uses a single software product to record all sales, purchases, and expenses in a digital format. The software has the necessary functionality to maintain the mandatory digital records, prepare the VAT Return, and submit this to HMRC via an API. In this situation, all data transfer must be digital. The image below describes a business that uses accounting software and API-enabled software. It uses the accounting software to record all sales, purchases, and expenses in a digital format, and then transfers the totals for each of these to API-enabled software which prepares the VAT Return. The API-enabled software has the necessary functionality to maintain the mandatory digital records, prepare the VAT Return, and submit this to HMRC via an API. 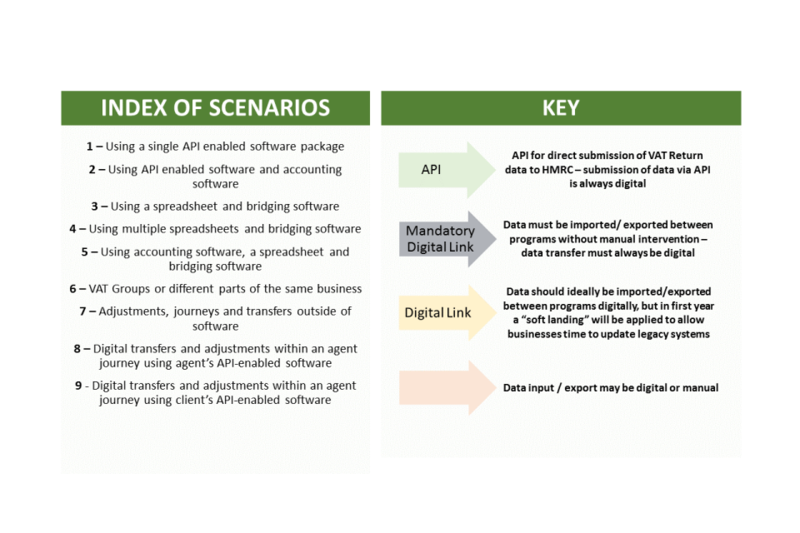 During the soft landing period, HMRC will not require a digital link between the accounting software and the API-enabled software. However, for VAT periods commencing from 1 April 2020, there must be a digital link between the software. 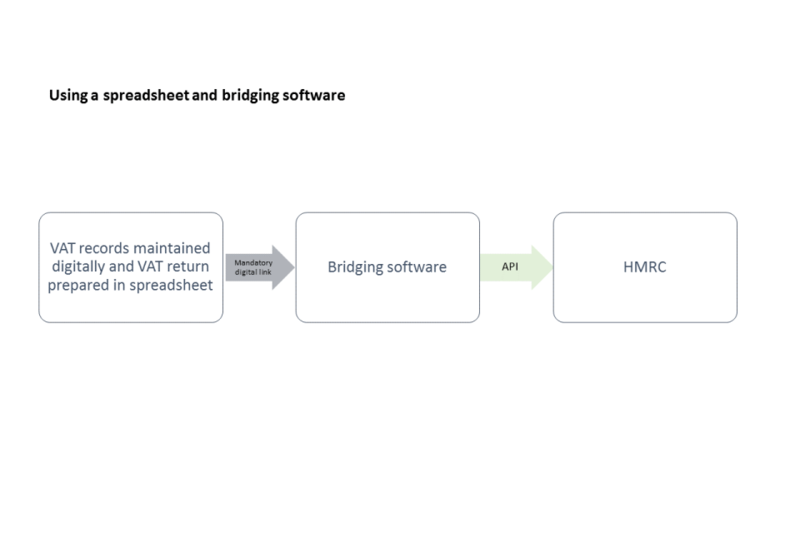 The image below describes a business that uses a spreadsheet and bridging software from April 2019, which allows the information to be transferred to HMRC via an API. It uses a spreadsheet to record all sales, purchases, and expenses in a digital format. The VAT Return is then prepared within the spreadsheet, using formulae already written into the spreadsheet. 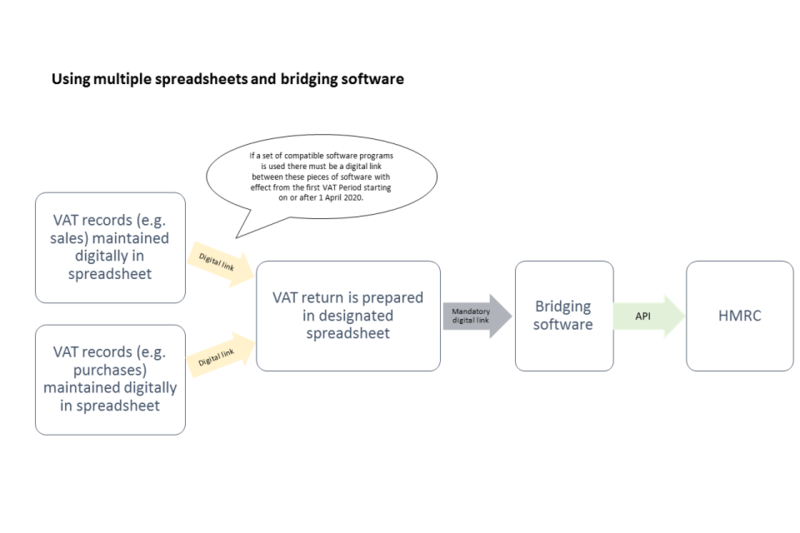 The VAT Return information is then sent via a mandatory digital link to bridging software, which digitally submits the information directly to HMRC. The image below describes a business that uses more than one spreadsheet, linked to bridging software. During the soft landing period, HMRC will not require the spreadsheets that supply the relevant data for the final spreadsheet to have a digital link. 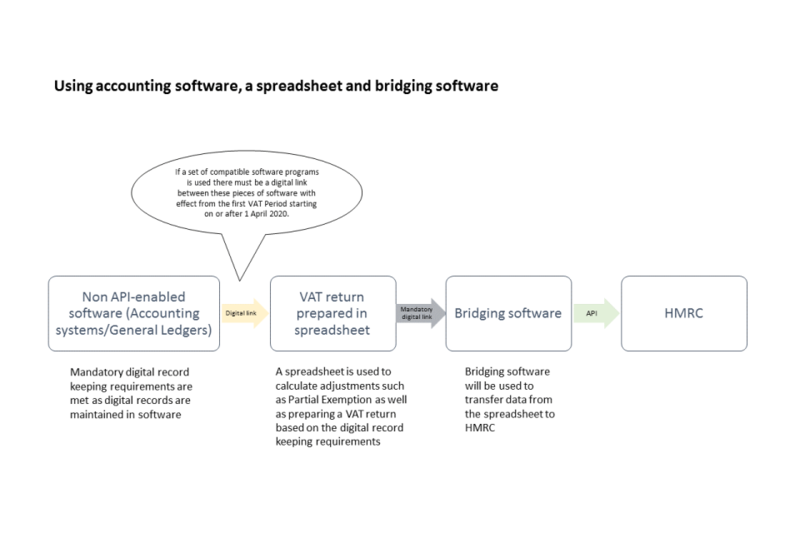 However, for VAT periods commencing from 1 April 2020, there must be digital links to the final spreadsheet. Altogether the 3 separate pieces of software maintain the digital electronic records required by the regulations, prepare the return and submit it to HMRC. During the soft landing period between 1 April 2019 and 31 March 2020, HMRC will not require a digital link to exist between the non-API-enabled software and the spreadsheet. However, all information must be transferred between software programs using a digital link for VAT periods commencing from 1 April 2020. 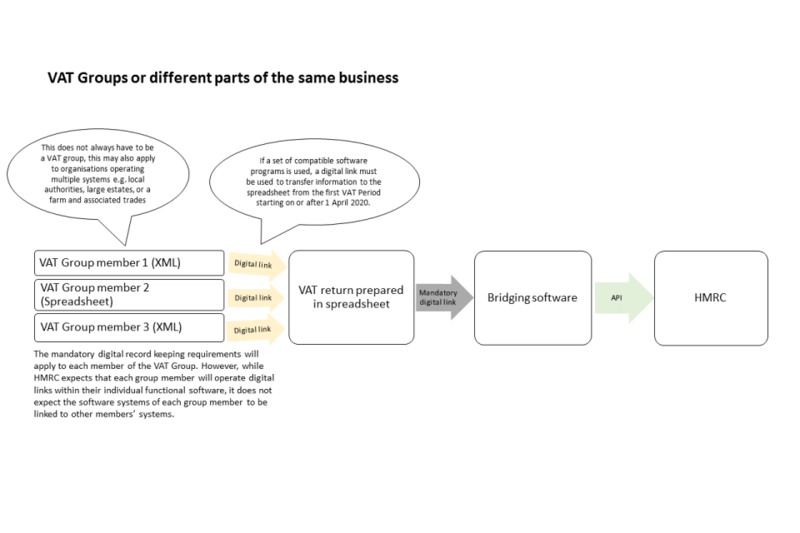 The image below describes VAT groups or different parts of the same business where each member of the VAT group (or different area of a business with a single VAT registration) uses their own software to keep and maintain digital records. This might include a local authority, a farming business with a separate farm shop or B&B, or a large estate. The group or business uses one spreadsheet to prepare the VAT Return information and bridging software. Together, the separate pieces of software maintain the digital records required by the regulations, prepare the VAT Return and submit the return to HMRC. During the soft landing period between 1 April 2019 and 31 March 2020, HMRC will not require a digital link to exist between each group member’s software and the spreadsheet. However, the links between the pieces of software must be digital from 1 April 2020 for the set of software to be considered functional compatible software for Making Tax Digital purposes. While HMRC expects that each group member will operate digital links within the software that it uses, it does not expect the software systems of each group member to be linked to other group members’ software systems for VAT purposes if there is no need for them to transfer 9 box VAT Return information between the members. The image below describes a business that uses API-enabled accounting software and spreadsheets. It uses the API-enabled accounting software to record all sales, and purchases, and expenses in a digital format. This software is able to prepare the VAT Return. However, the business uses a spreadsheet to calculate adjustments such as a partial exemption calculation or working out road fuel scale charges. Information from the API-enabled software such as inputs, outputs and totals, is transferred to the spreadsheet either via a digital link or by manual transfer. The spreadsheet uses this data to calculate any adjustments, and these adjustments are transferred back into the API-enabled accounting software, which calculates and submits the VAT Return. As the calculations in the spreadsheet are not required to be kept digitally in functional compatible software, the business can type the adjusted figures into its API accounting software. However, using a digital link for these processes, rather than a manual transfer, reduces the chance of errors. 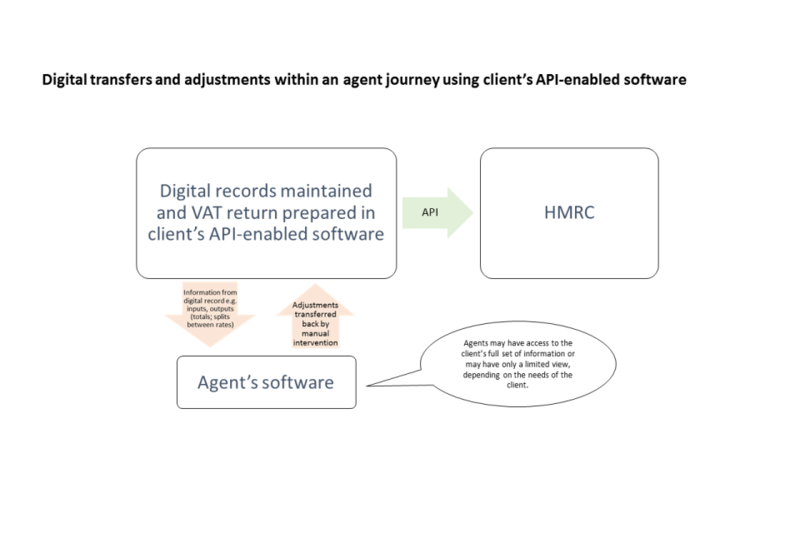 The image below describes a business that uses accounting software and employs an agent to prepare and submit its VAT Return using the agent’s API-enabled software. The business uses accounting software to record all sales, purchases, and expenses in a digital format. It transfers this information to the agent through a link which must be digital for VAT periods commencing from 1 April 2020. 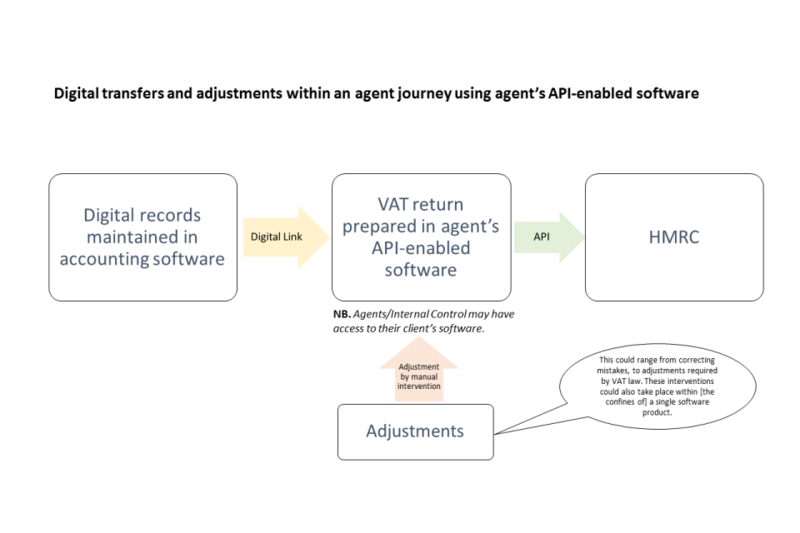 Once the data is transferred, the agent uses their API-enabled software to prepare the VAT Return for the business. Any amendments that are made outside of the agent’s software (for instance, in a spreadsheet), from correcting mistakes to adjustments required by VAT law, is entered into the agent’s functional compatible software. These amendments are part of the required digital records. This means these changes must be either recorded in the client’s records or the agent must store the changes and allow the client can access to the records. The agent’s software then prepares the VAT Return and submits this to HMRC via an API. As the adjustments made outside of the agent’s software are not required to be kept digitally in functional compatible software, the agent can type the adjustment into their accounting software. However, using a digital link for these processes, rather than a manual transfer reduces the chance of errors. The image below describes a business that uses a single functional compatible software package but also uses an agent to calculate adjustments, which the agent does using its own software. The business uses its software package to keep its digital records and prepare and submit the VAT Return. It gives the agent access to its software. Depending on the needs of the business, agents may be given access to either the client’s full set of information or only be given a limited view. The agent selects the necessary data to enable it to make adjustments in its own software. Any corrections or amendments must be reflected in the client’s digital records. Adjustments may be made in the business’ software by the agent manually. However using a digital link to transfer the information will reduce the chance of errors. Once amendments have been fed back into the VAT Return, the return is digitally submitted from the business’ software to HMRC via an API. Together, all the software described above (business’ software and agent’s software) maintain digital records as required by the regulations, prepare the VAT Return and submit the return to HMRC.